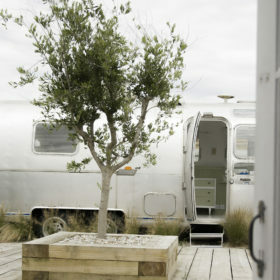 Sandy Bay Cabins is uber-cool, not least the Airstream caravan, which could spark a battle bigger than Hastings’ famous tiff down the road. The cabin’s bleached and beachy, the woodburner’s waiting to spark and the deck’s ready for a sizzling steak in the ocean air. 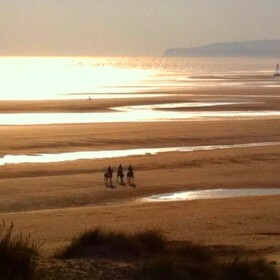 Follow the briny scent of the sea down to classic Camber Sands. Cool, cool, cool. 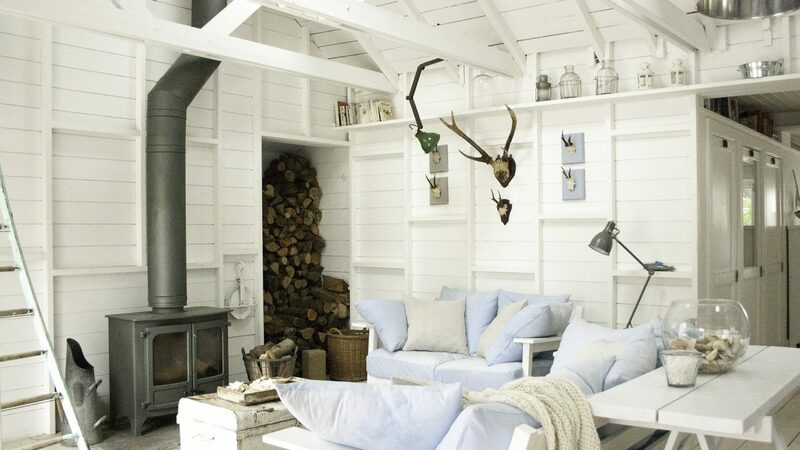 Everything about Sandy Bay Cabins says cool. 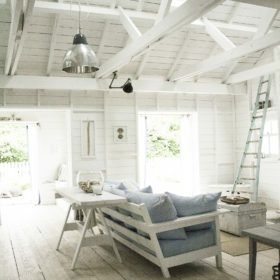 There’s the beachy, bleachy, whitewashed interiors. Cool. The deckchairs out on the private deck. Cool. The woodburning stove. Cool. The pooch-friendliness. Cool. The outdoor cabin. Cool. And the Airstream caravan. That’s uber-cool. Perhaps the coolest thing about Sandy Bay Cabins, though, is the location. 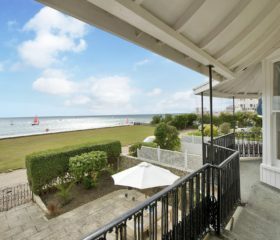 It’s a beach house right opposite the famous Camber Sands, setting of many a movie and where pop icons Squeeze pulled their mussels from the shell. Where England ends, its parting gift on the Sussex coast is wispy grass, soft sand and clear-blue seas. 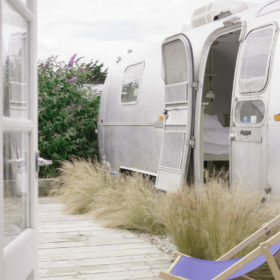 Sandy Bay Cabins sleeps 13, but some of you might be battling for a berth in the vintage Airstream. Out by the deck and the woodstore, with the beach grasses gently bowing in the ocean breeze, the van’s done nicely inside in green clapboard. There’s a bathroom, too, so you might never emerge. 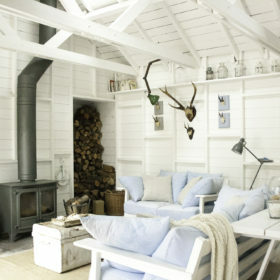 The cabin itself is like a White Company catalogue. 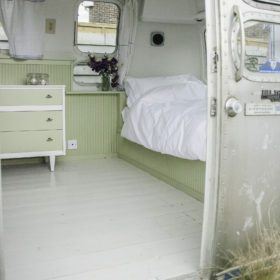 The floorboards are white, the ceiling, the window seats, the curtains, the showers and the kitchen. The building seems to summon the spirit of the sea before it’s even visible over the horizon. But cross the road and you’re there. Bring your buckets and spades. 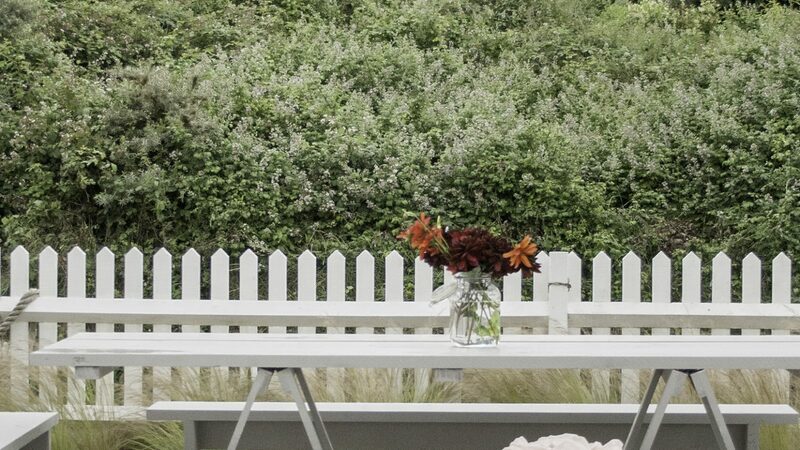 Not so much a garden as an open invitation to breathe the sea air, fire up the barbie and recline on the deckchairs. 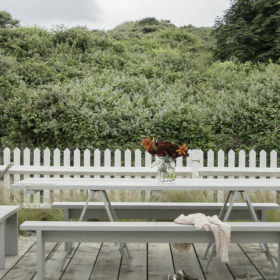 Embrace the coastal life, as the sea grasses stir in the breeze and the cabin’s white wooden clapboard keeps you company, with its intimation of soft dunes and blue seas. 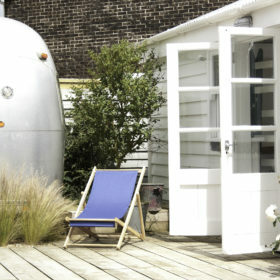 Sit by the woodstore on the deck with a glass in hand and savour the outdoor life suggested by the vintage Airstream. Take a bath on the deck. No, really. It’s freestanding, natch. Just beyond the white picket fence, over the road, you can walk barefoot to the best garden of all: the golden beauty of Camber Sands with its grass-fringed dunes, big skies and seven miles of Blue Flag bathing. Spaces here are light, bright and inviting. 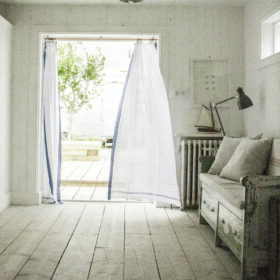 There’s aircon, but you can just open the doors to the deck and let the soft curtains billow in the sea breeze. 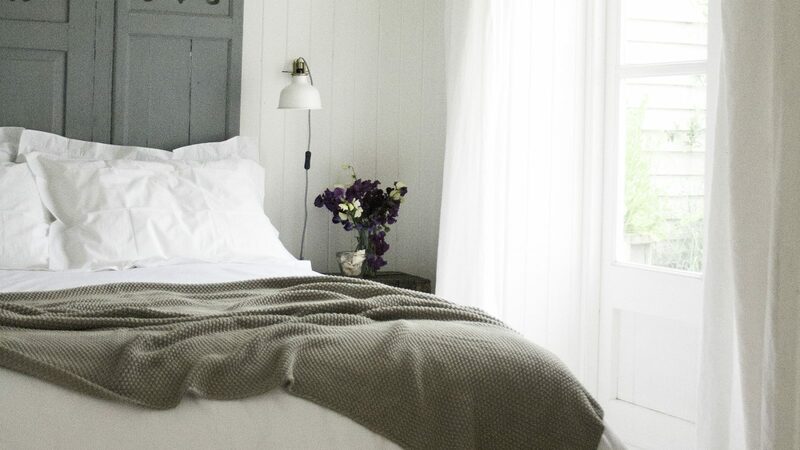 The interiors harmonise you with the ocean: the whitewashed floorboards and ceilings, the clapboard walls and the portholes, the flags that flutter in the wind. 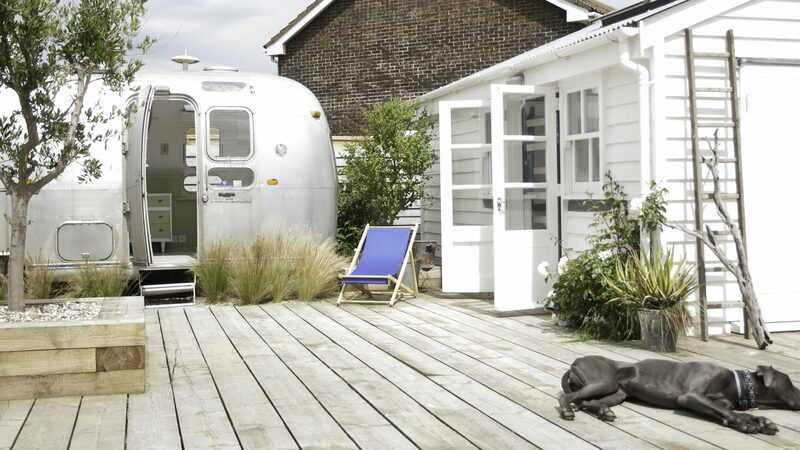 This is a place to live the seaside dream, with its beatnik feel exemplified by the vintage Airstream caravan and its airy spaces. 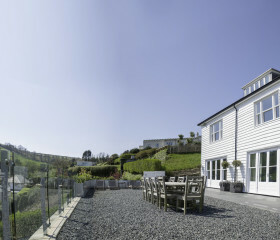 Throughout, the lived-in look reigns supreme: this is an authentic place that looks like it’s been tempered by the sea. Bespoke leather chairs and authentically weathered radiators all work so well. Get together in the main living area, among reclaimed fabrics and woods, with the woodburner and log pile the focal point. Fire it up and let the warmth spark happy chatter and family fun. 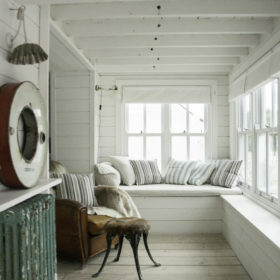 Escape to turn pages in quiet corners on the window seats that line the house front. Two Smart tellies come fully armed with Amazon Prime, there’s a Bose iPod dock for tapping in to some tunes, and a selection of toys, books and DVDs for the kids. BT wifi buzzes about. Despite the tech, these are spaces where you never lose the seaside feel, because it’s with you in every white-soaped plank and porthole window. 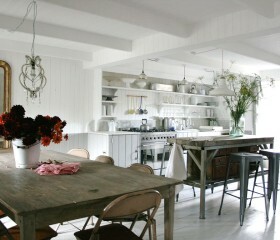 The kitchen is as white and bright as the rest of the place. A sea-blue dual-fuel range cooker harmonises with blue chairs as you gather round the kitchen table to savour fruits of the sea at suppertime, or at breakfast for croissants and coffee from the Bialetti coffee percolator or cafetiere. It’s all here when you need it: the microwave, hob and toaster and, when you’re done, you can pile the dishwasher high, open up the doors and soak up the sea air with a quiet Pinot Grigio. In summer, break out the gas barbie on the deck and infuse the air with the sweet scent of sizzling steak. Or you can leave it all to us. 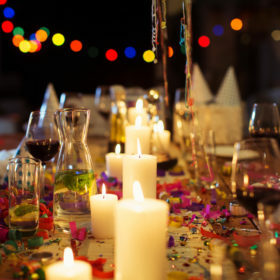 For a special event or a fully catered break, we have chefs who’ll do you proud, then do the dishes, too. 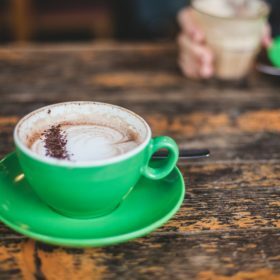 Head out and about to find coffee and carrot cake at dog-friendly Bosun’s Bite in Rye, tuck into the freshest fish at Marino’s or a belt-busting breakfast at Beryl’s Café. 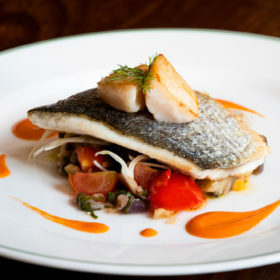 Go gastro at The Plough for the slow-cooked Romney lamb or scallops. Head to Hastings for Naples street food from Rustico Italiano, to Cinnamon Spice for authentic Asian, or to Nazar for a Middle-Eastern seafood stew. At Mama Putt’s African Caribbean Restaurant, follow up Scotch bonnet with a nice goat soup. 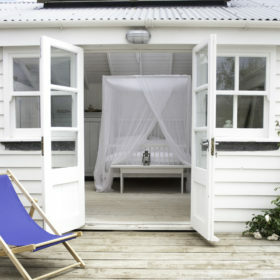 Sandy Bay Cabins sleeps 13 comfortably in four bedrooms, within calming earshot of the wash of the waves on the beach over the road. 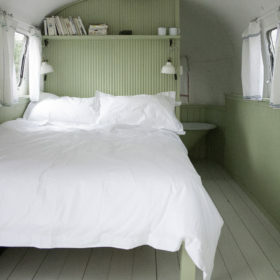 Take your pick from the house, cabin and vintage Airstream. They all have a holiday feel, but the caravan probably shades it for outright cool. 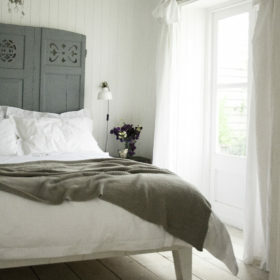 The master bedroom is a kingsize with the same stripped-back, beachy feel as the rest of the property. 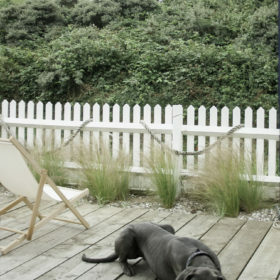 Clapboard walls and a cool grey bedhead add to the calming effect and double doors offer a swift escape to the deck. The bunk room comes with four singles, perfect for kids who missed out on the Airstream. 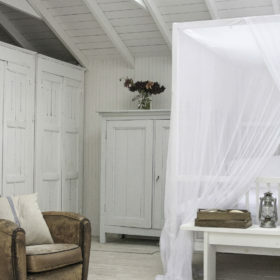 The cabin room sleeps four in a kingsize bed and a bunk, and there’s an en-suite shower room. 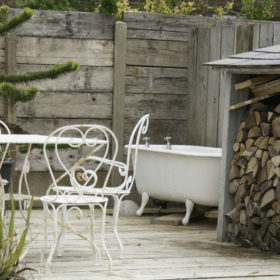 Finally, the caravan out in the garden by the deck offers real family memories in the making, with one double, one single and its own bathroom. The main house also shares one main bathroom. 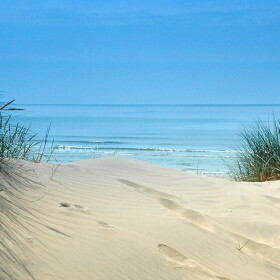 Camber Sands is just over the road, flying the Blue Flag above its endless dunes. 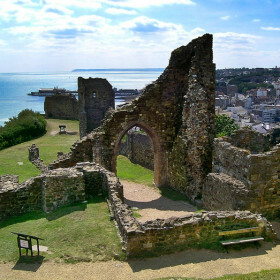 Further afield, there’s Britain’s only desert at Wild West Dungeness, pig-racing at Ashton Rare Breeds, and the relics and ruins of 1066 Country. Eat at Whitstable’s Michelin-starred Sportsman and drink at Olde Worlde Wines in Rye.